One of the 12 goals I will accomplish as Superintendent of Public Instruction is to raise teacher pay by 33%. In this article, I will explain why it is essential to dramatically and immediately raise teacher wages in Washington state if we are to give our students the education they need and deserve. Beginning teachers in Washington typically spend 5 years in college to get their teachers degree and provisional teachers certificate (which typically occurs after a several month practicum during their 5th year of training). The average beginning teacher incurs about $50,000 in student debt to get their 5 years of training in education and child development to become qualified to teach. 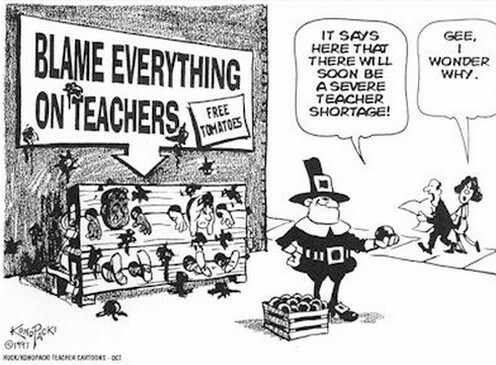 The problem is that Washington beginning teachers currently make only $36,000 per year. After paying taxes and their college loan payments, most young teachers are forced to survive on less than $2,000 per month. They cannot even pay for rent, food and gas on this level of starvation wages - much less buy a home or raise a family. This is why college students no longer want to become teachers. This is also why almost half of all school districts in Washington state can no longer find enough qualified teachers to teach subjects like math and science. To add insult to injury, over the past 20 years, the Washington legislature has cut the buying power of teachers nearly every year by refusing to grant them the Cost of Living Adjustments. This has resulted in real teacher wages going down and down every year until now teacher wages are 33% less than they were 20 years ago. As a result of the state legislature turning their backs on our teachers and our kids, teacher salaries in Washington state are now the 4th lowest in the nation (this is in addition to dealing with the highest class sizes in the nation and the highest teacher work load in the nation). A 2012 Compensation study by a Washington State Commission found that we would need to raise teacher pay by 33% just to be competitive with other West Coast States. The Compensation Commission recommended raising the pay of beginning teachers from the current $36,000 per year to $48,000 per year. This was in 2012. With cost of living adjustments since 2012, the real recommendation is now over $50,000 per year. A recent study of teacher wages across the nation by Rutgers University found that Washington was one of the least competitive states in the nation in terms of pay for both beginning teachers. 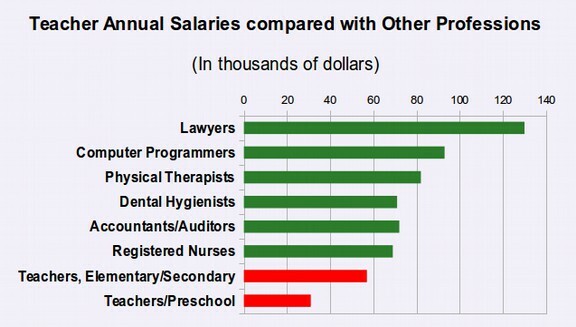 A major reason teachers suffer from a much higher turnover than other professions, besides the fact that they are being attacked by billionaires is that are among the lowest paid of all professions. 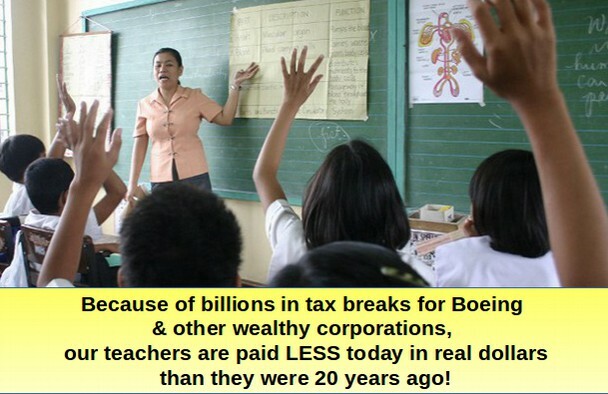 Billionaires have been bashing teachers ever since the 1980s. But it was not until the harsh mandatory punishments of No Child Left Behind that the constant stream of abuse has had a negative financial impact on teachers – as thousands of excellent experienced teachers were fired simply for serving at a school that taught low income students. However, in addition to thousands of teachers being fired, thousands of additional experienced teachers have quit the teaching profession in disgust of all of the ed reform scams being inflicted on students in public schools. 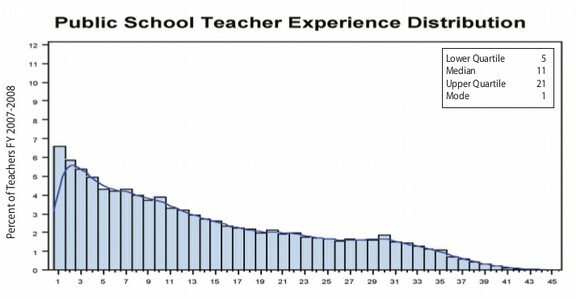 This has cause a major shift in the distribution of experienced teachers at our public schools. 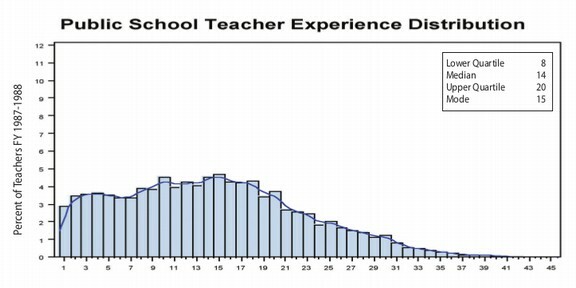 Note the even distribution in years of teaching experience with many more teachers having 10 years of experience than teachers having only one year. Today, the largest category of teachers are first year teachers - with more than twice the percentage of first year teachers as there was 30 years ago. 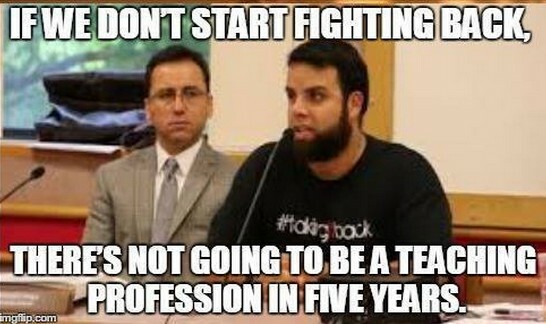 Every year, more teachers leave in disgust. Instead of helping teachers become better, attacking teachers has led to a huge drop in teacher satisfaction. A 2010 National Teacher Survey by Met Life found that teacher satisfaction levels have plummeted since stifling Common Core mandates were imposed. With hundreds of thousands of experienced teachers having been fired in the past five years, and Congress deciding that a person with five weeks of training is now “highly qualified,” it should come as no surprise that college students are reluctant to train for a career as a teacher. For example, in fall 2004, there were 18,685 students enrolled as education majors at the 14 schools in the Pennsylvania State System of Higher Education. Ten years later, that number had dropped a third to 12,569. It is even worse in California where enrollments in teacher preparation programs have declined dramatically. According to a 2013 report prepared for the California Commission on Teacher Credentialing, 26,446 students were enrolled in teacher preparation programs in 2011-12 – a 66 percent decline from a decade earlier, when 77,700 students were enrolled. The declining enrollments are echoed by similarly declining numbers of teaching credentials. At the California State University system, only 5,787 credentials were issued in 2011-12 to students in its teacher preparation programs, down from 13,933 in 2003-04. Over the past five years, the teaching profession in California has been devastated by layoffs; some 26,000 teachers lost their jobs as a result of the state’s budget crisis. With all of these experienced teachers available, it is very difficult for new teachers coming out of college to even find their first teaching job. Another problem inflicted on teachers and students due to the billionaire attack on our schools is huge increases in class sizes. 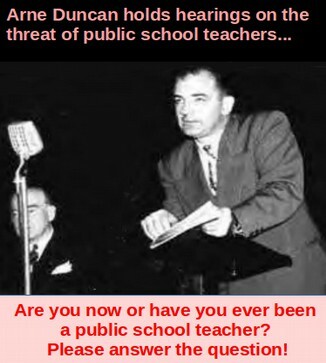 In 1980, at the beginning of the attack on teachers under Reagan, Washington State was 11th in the nation in school funding – spending about 6 cents out of every dollar in income in our State on public schools. By 2000, our state fell down to the national average in spending on public schools which is about 5% of income. By 2012, Washington fell to 47th in the nation in school funding at 4% of state income. As a result, class sizes in Washington state are now among the most overcrowded in the nation. Many math teachers have more than 35 kids per class with 5 classes per day – for a total of 175 kids per day. Is it any wonder our kids are having trouble learning math? 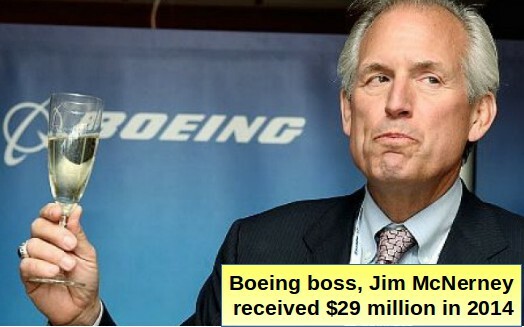 Meanwhile, Washington state legislators have increased tax breaks for wealthy multinational corporations like Microsoft by more than ten billion dollars per year. The biggest winner of the tax exemption scam is none other than tax evader Bill Gates – who robs of schools of more than one billion dollars per year by refusing to pay his fair share of state taxes. My daughter is in the 10th grade in the Snoqualmie Valley School District - the lowest funded school district in Washington state and one of the lowest funded and most overcrowded school districts in America. My daughter routinely has 35 kids in her classes. Once she had a class with nearly 100 kids in it. This year, she took an Algebra 2 class. The class was so over-crowded that after the first couple of weeks, the teacher told the kids they were falling too far behind and the kids were not allowed to ask any more questions. I told my daughter to keep asking questions. The class continued to fall behind. After 4 weeks, the teacher had a nervous breakdown and had to take time off. He was gone for the next three months. Due to the extremely low wages paid to teachers, the school district did not have a single qualified math teacher to replace him. So the kids had a series of "emergency substitute" babysitters who knew nothing about Algebra 2. The kids had to learn Algebra 2 with no help from anyone. I am a former math teacher and I spent several hours a night helping my daughter with her Algebra homework. Sometimes we were up until Midnight. A couple of weeks ago, the school passed out letters telling students who had scored high enough to move on to Precalculus next year. My daughter was one of only two lucky students to be allowed to move on. All of the other students have been permanently harmed because our high school does not have enough qualified math teachers. But it is not just Mount Si High School that is suffering from a teacher shortage. A recent survey of 700 principals in Washington state found that nearly half of them could not find qualified teachers to fill open positions. The problem was particularly dire for math, science and special education teachers. 80% of all principals were required to employ teachers with only emergency teaching certificates - people who have not completed the 5 years of training required to be a real teacher. To deal with the current teacher shortage and encourage more college students to become teachers, I will pay off student loans of all teachers at a rate of 20% for each year of service meaning that if a teacher works for 5 years, they will no longer have any student debt. It would take an additional one billion dollars per year to fairly pay our teachers in Washington state. This is why I say that the state legislature is robbing our teachers of one billion dollars per year. I would pay for this restoration of fair teacher wages by rolling back tax breaks for billionaires and multinational corporations to what they were in 1996. It would take another $4 billion per year to hire tens of thousands of teachers needed to cut class sizes in half and another $2 billion to build 200 schools per year for the thousands of new teachers to teach in. The question voters must ask themselves is what is more important - giving the richest man in the world a tax break of one billion dollars per year - or raising the pay of our 60,000 hard working teachers so they can buy a home and raise a family? We will need to attract about 40,000 young adults to become teachers if we are to succeed in cutting class sizes from the current 32 students per class down to 16 students per class so that struggling students can get the help they need to succeed in school and succeed in life. Whether the Supreme Court decides to void billions of dollars in tax breaks or not, we also need a long term solution to the school funding crisis. Therefore as Superintendent of Public Instruction, I intend to spend my four years in office traveling around the state explaining how tax breaks for the rich harm our public schools and encouraging parents and teachers to run for office against our current corrupt legislators. If we could boot even a few of the current batch of legislators out of office, the rest would come to see that their re-election depends on funding schools instead of funding tax breaks for the rich. What we really need is a rebirth of democracy and a grassroots effort to build a coalition of the caring - electing people who really do care about funding our schools instead of merely saying they care but never really doing anything to actually fund our schools. Finally, we need to see the teacher pay shortfall as part of a bigger problem where the entire process of education in our state has been gutted all to pay for tax breaks for the rich. This is why increasing teacher pay is only one of 12 goals we will need to accomplish if we are to give our kids the education they need and deserve. 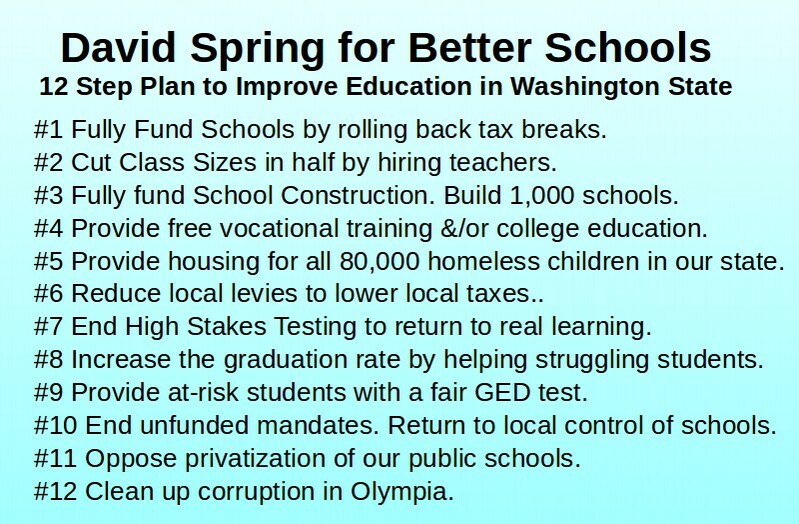 I will use the Superintendent's office as an independent and objective source to expose corruption, clean up Olympia and restore school funding here in Washington State. As always, I look forward to your questions and comments!